In many countries, global warming gives rise to flooding through the use of hydraulic dams. Blue Shark turbines can advantageously replace dams and provide energy for people and businesses everywhere with an affordable cost. This is why the team of Blue Shark Power has been developing a new turbine, especially aimed for big rivers. The twin horizontal axis water turbine Blue Shark Pillar is a hydrokinetic machine designed to produce clean energy exploiting slow-moving flows of water, namely river, tidal or water currents, in low depths. The device is able to harvest energy with a rated power of 30 – 700 kW according to the turbine diameter and the speed of the water current on a choosing site. The device is located between the surface and the bottom floor at the desired depth (from 3 to 12 m), aligning itself to the current independently from its direction. Blue Shark Pillar is a water-current energy conversion system using two horizontal axis hydro-turbine mounted on the side of a supporting submersible structure. A winch is installed on the top of the pillar in order to control the effective depth and to allow an easy maintenance purposes. Two asynchronous generators are installed on board and mounted on the turbines shafts through a gearbox. Each generator is electrically controlled by inverters, both for grid connection purposes and in order to reach optimal working conditions at different current speed. The power connection is provided through a power cable, passing along the pillar and extended until the shore grid connection point. The 3 bladed turbines have been developed and designed in order to reach a high efficiency in a relatively large operating conditions range, using a properly designed airfoil section shape. 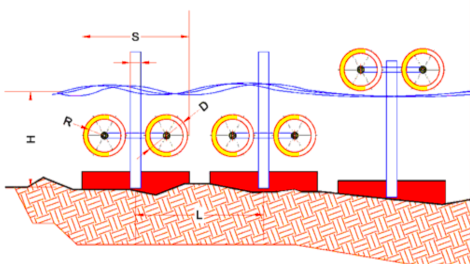 A diffuser is placed around each turbine and allows an enhancement of the energy conversion process, increasing the mass flowing through the turbine swept area. The blades and the diffuser are made of carbon fiber. One of the major feature of the system is the self-orientation ability, particularly useful in reversing current, such as tidal cycle. • Blue Shark Pillar is to be used in sites with depths from 3 to 12 m.
• No heavy lifts are required, as Blue Shark Pillar can be towed to and from site with a small pontoon. • Easy access can be gained to the power electronics and control systems placed on the top of the pillar, out of the water. • Blue Shark Pillar turbines always align themselves directly into the flow, optimizing the blade area presented to the current to maximize power production. This ensures drag and loadings are minimized.